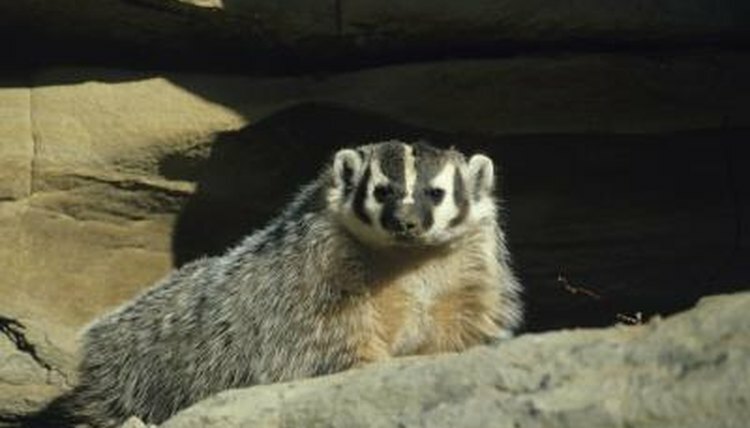 American badgers are small, burrowing mammals in the weasel family. They live throughout North America, from Canada to Mexico. With strong jaws and powerful claws, they have short, sturdy legs and long, flat bodies built for maneuvering in tight spaces. Their shaggy fur ranges from brown to gray; white stripes run along their backs. American badgers generally prefer open space where they can burrow easily. They most commonly inhabit grassland ecosystems like plains, prairies and deserts. Some make home the mountains. They construct hundreds of intricate burrows, inside which they search for food and mates. They use other animals’ burrows, and their burrows in turn become home to snakes, rabbits, skunks or burrowing owls. Their burrows usually have single entrances and may overlap one another, especially during breeding seasons, as males dig to seek out females to mate with. Otherwise, badgers are solitary animals who do not depend on one another except to reproduce. Badgers’ digging habits not only create homes for other animals in the ecosystem, they also play an important role in soil health. Their burrowing aerates the soil, breaking it up to allow air and sunlight in, nourishing plants. Badgers are among the most important carnivores in the grassland ecosystem. They prey on mice, voles, gophers, rabbits and other burrowing animals as well as birds, insects and reptiles. With their strength and agility putting them near the top of the food chain, badgers keep other populations in check. Though they are solitary animals, they sometimes hunt alongside coyotes, occasionally exhibiting playful behavior. Badgers’ and coyotes’ hunting styles pair nicely, as a badger can chase a prey animal underground while a coyote waits for it at the entrance to the burrow. Badgers have relatively few natural predators -- among them are cougars, bobcats, golden eagles and occasionally coyotes, wolves or bears. As farming and industrialization have disrupted badger ecosystems, in some areas badgers have become pests. Their burrowing can harm horses and other livestock, and they divert irrigation canals. Their burrows can cause accidents. Badger populations face multiple threats, such as the eradication of their prey, destruction of their habitats, and in some areas trapping, poisoning and hunting. Many become victims of highway traffic. Badger populations are thought to be stable throughout most of the United States, though a few are in decline. It’s illegal to hunt badgers in Michigan, Wisconsin, Illinois and British Columbia. Scientists warn that future urbanization will likely threaten more American badgers, urging the importance of further study into the ecosystems they inhabit.